This will be one of many attempts to perfect the macaroon. Hugh was in San Francisco last weekend, and brought home a bag of macaroons from Bi-Rite Market. He said they were a "gift for me", and proceeded to eat all but one and a half of them. The cookie (if it can be called a cookie?) 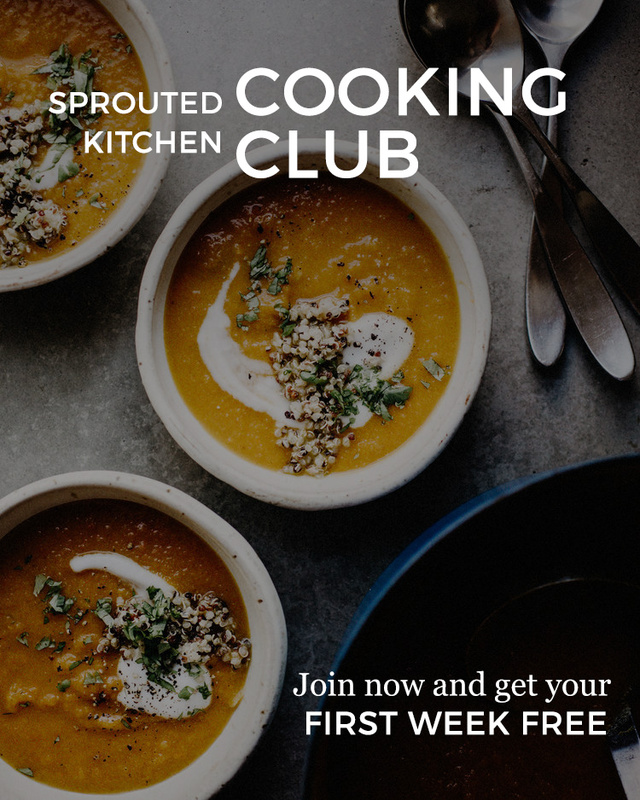 is typically composed of coconut, egg whites, sugar and vanilla, and you will find recipes made of differing proportions of the former, plus or minus an ingredient or two. I've had ones made with sweetened condensed milk, and do like the moisture it contributes, but it makes the lighter treat, a tad too heavy. Though it does sound like a lot of sugar, we didn't find this version to be overly sweet at all. If you scale it back too much, it taste like a coconut omelette. 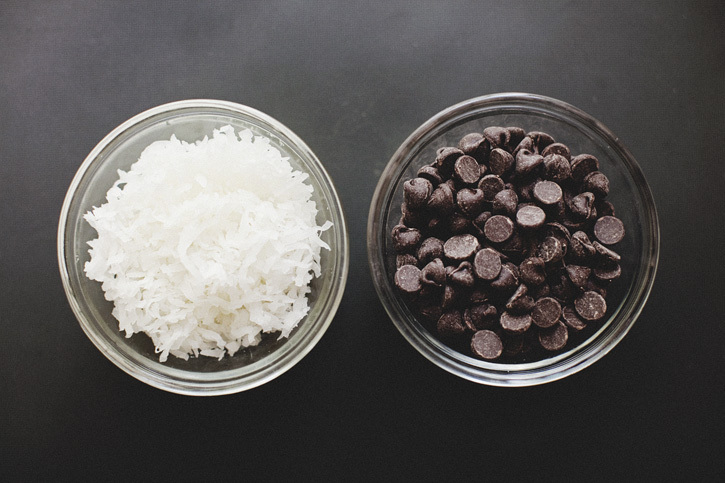 Coconut is wonderful, but the contrast of the dark chocolate makes these babies exceptional. We leave for Scotland this afternoon, yay! Hugh was commissioned to shoot a wedding over there, and myself commissioned to come along for the adventure. My suitcase is bulging and my backpack is stocked with snacks. We will be gone for awhile, so please excuse a bit of a hiatus here (we'll try to post pictures if the opportunity presents itself). I am SO excited to get on a plane and go on an adventure; especially with my favorite person. A collaboration of few bustling cities, taking the train through rolling green hills and making friends with people in kilts. They'll want to be my friend because I have a backpack full of goodies. 1. Beat the egg whites with a whisk until they are loose and frothy. Add the salt, vanilla, sugar, honey and combine. Add the coconut and stir. See starred note for consistency advice. 2. Using a small spoon, dollop about 2 Tbsp. of the mix, two inches apart on a cookie sheet lined with either parchment paper or a silpat. 3. Bake in the oven for 14-16 minutes on the middle rack. Remove and cool completely. While the macaroons are cooling, heat the chocolate chips over a double broiler, or glass bowl over simmering water. Be sure to not let the glass touch the water to avoid scorching. Continue to stir until chocolate is melted. 4. Lay out a new piece of parchment paper. 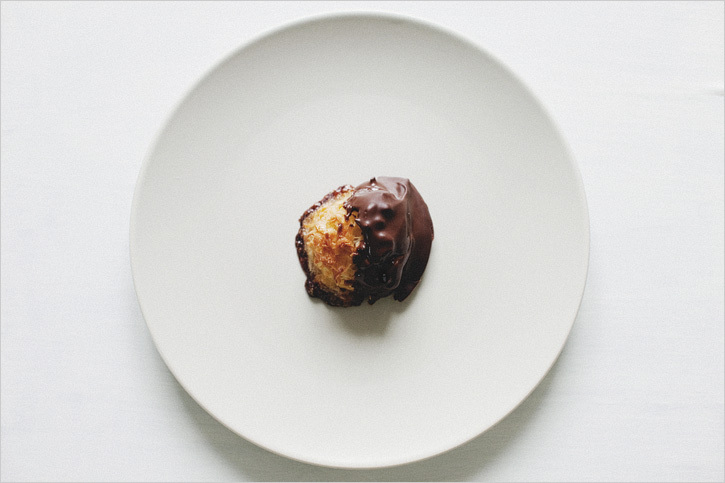 Take a cooled macaroon, and generously dip half into the melted chocolate. Lay on the parchment for chocolate to harden. This time could be expedited in the fridge or freezer. * The consistency of the mix will vary depending on the size of your egg whites and also how your coconut is shredded. When the mix sits in the bowl, you don't want it to be weeping any liquid, it should hold itself together while still being moist. If anything is puddling at the bottom, add a bit of flour or GF flour to help dry things up. Add little by little, you may not need all of it. I needed to use the flour, as my eggs were large. Use your discretion and look for consistency before sticking to the measurements.